During a recent appearance on The Breakfast Club, California Senator and presidential hopeful Kamala Harris admitted that, duh, of course she’s smoked weed (and inhaled). We’re into it, but there’s plenty of people taking issue with her story of youthful indulgence, specifically her claim that she was listening to Snoop Dogg and Tupac Shakur at the time. “I think it gives a lot of people joy, and we need more joy,” Harris said when asked about the drug’s legalization. This was just moments after the former Attorney General laughingly admitted that she had smoked a joint back in college. But when Charlamagne and co-host DJ Envy pressed her for more details, the timeline started to get a little confused. “What were you listening to when you was high?” Charlamagne asked, leading Envy to inquire if it was, as it’s been for so many others, Snoop. “Oh yes, definitely Snoop. Uh-huh. 2Pac for sure,” Harris responded, reaching back into those foggy, resin-smeared memories. Do a little research, though, and you’ll find that Harris graduated college in 1986 and was admitted to the California Bar Association in 1990. Any hip-hop head worth their salt knows Tupac and Snoop didn’t hit the scene until the early ‘90s. Harris was still smoking weed when she was a California attorney. As suggested by Stereogum, Harris somehow procured underground demo tapes of a teenage Snoop. 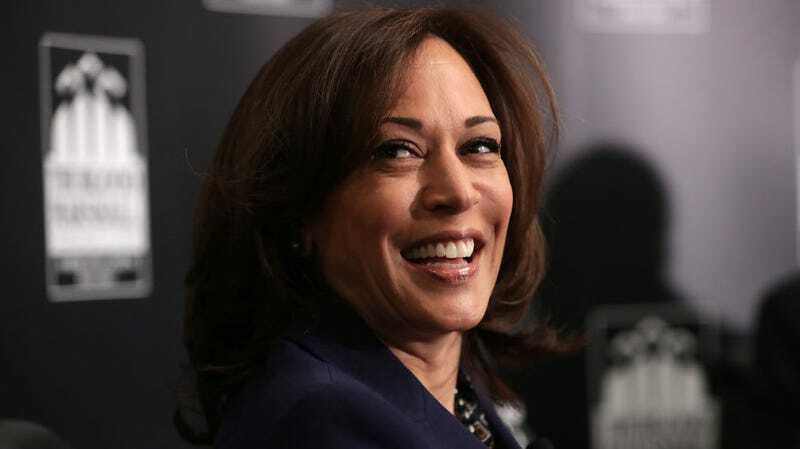 Or, the most likely reason, Harris is running for president and wanted to sound cool on the radio so she just smiled and named the first rappers that came to mind. Now, can somebody please ask Beto what we was listening to while doing gravity bong rips with Cedric Bixler-Zavala? Yeah, it was probably Willie Nelson, but we’re still curious.